Why you should stop using Auto-Dm! I have to confess as much as I dislike Auto Dm’s while using TrueTwit validation I was Auto Dm’ing all my new followers on the various twitter accounts I managed including my personal one. It supposedly helped out with automatically accepting new followers and filtering bots. After many complaints and finding out how much these actions annoyed my twitter followers I decided to stop automatically accepting followers and to sending automatic DM’s. The irony with Truetwit was that it ended up annoying the real followers and it obviously did not affect the spammers and bots. What I do when I receive an Auto DM? I think of unfollowing the person. Although I did confess I use to Auto-Dm now that I am a converted Non-Auto Direct Messenger I get a quick impulse of wanting to unfollow the person. I quickly browse thru their profile and if the rest of the conversation seems to look like they are just self-promoting or spamming then hitting the un-follow button comes next. I ask myself why the person decided to take this approach. After analyzing their tweets I usually reach out and if I deem it appropriate I ask them why they use they sent me an auto-dm. I want them to stop as soon as I see one come in. Some services allow you to unsubscribe others don’t if it bothers you that much you might want to go ahead and put a stop to some of these services. No matter how you want to justify your Auto Dm’s they are defined as Spam. They are not requested by your new followers and it is kind of going against the trust this person just gave you by following you. Most people are too polite to notify you that Auto-DMs annoy them. I have seen how many people feel disgusted by Auto Dms and the same way they just followed you by hitting a button they will unfollow you by hitting the unfollow button. This is a consequence because you gave a bot the task to do your engagement on twitter. Immediate sensation of disgust are felt by many when they receive an Auto-DM, most people are against using and receiving Auto Dm’s. I have never met someone who truly believes they are useful or serve a purpose. Ask your followers like I did and see the following tweets on how most of them felt when it comes to Auto DM’s. Take 10 to 15 minutes every day and getting to know your new followers. Take a look at their blog and maybe comment on one of their posts. Read their tweets and answer them back genuinely on any tweet you can relate too. Create a list of your last 20 followers and monitor them for the next few days or weeks so you can make sure you are engaged with them. Re-tweet any of their content with a line expressing your point of view. There are many reasons why people retweet content on twitter. I have many reasons but when I retweet its because it goes with my interests and overall my values. I see a Re-tweet as an extension of my ideas. Some people Re-tweet because they have there own agenda and even go so far to constantly re-tweet there own material on the same account making me think if I have to update My Personal Facebook Like & Vote for Self Promoter Policy! to include self-retweeters on twitter. Those same people are usually expecting you to re-tweet their tweets because they re-tweeted yours. A Re-tweet can be valuable if you use it to inform people with information that can benefit them. That action can also increase the interest in your community and create tighter bonds and helping your community stay loyal to your and your efforts. Other people re-tweet because they are being polite I highly recommend you to re-tweet because you see value in what you are sharing. Being polite can be detrimental to your reputation since by sharing something that is no interest to your community it can make people lose interest in future tweets. If you genuinely re-tweet and take your time in reading the content you can also make sure that you have a good understanding of what you are sharing. Once you identify other tweeps that have your same interest you can re-tweet content that is relevant to you and this can increase followers and interaction. I re-tweet especially when people that are in my community have something to share that I support. One of the best ways to re-tweet is when someone is searching for an answer to a question. By you sharing the question with your network it increases the possibility of the person receiving an answer by you involving your community and network. Overall make sure that you are being yourself when you retweet and not because you want to be polite or make some one happy. What reasons make you re-tweet a post? What really makes you share something once you see it on your timeline? My business cards where delivered today after having the pleasure to work with great people in the process. A few weeks ago I changed the look of CIMA IT Solutions with the help of @ricklipsett’s talent by designing the logo of this blog and my corporate logo. I was very happy with @ricklipsett’s work and since he is someone I trust I asked for his recommendation on getting my business cards (which he had designed) printed. Rick recommended me to get them printed at @ColorSpotPR. I sent a tweet on the 28th of december to @colorspotpr and I got a reply that they where on vacation and would return on the 10th of January. Being in love with my business (I rather use this phrase than call myself a work-a-holic) I kept on thinking where else could I get them done. When I told them that it would be in another occasion they replied back in a courteous manner. I guess the joy of becoming a father allowed me to wait till the 10th.They got back on vacation and sent me a tweet letting me know they could be of help. Once I sent them the files they decided to send me a sample via snail mail. I received my sample and I thought something was missing. Given their approach at trying to work around my needs I called @ricklipsett letting him know what I thought was missing. He contacted them and within minutes @colorspotpr had contacted me publicly on twitter to see how they could help me. The @colorspotpr team was very helpful in explaining why my samples looked they way they did and invited me to visit them so they could make some samples on the spot. I drove up to Guaynabo and was greeted by two brothers who run their own business. I was able to presence the commitment they have into everything they where doing to make me happy while they kept out churning work. Since I drove up to San Juan they made sure to give me all the attention I needed. They also took me thru all the steps and ran me thru the process of what I should expect. I was very happy with the awesome customer service. I even got a nice treat by getting and upgrade in service including free shipping. Do businesses that you deal with give you as many reasons to make you smile and refer more customers? How many family based awesome companies do you support and recommend? 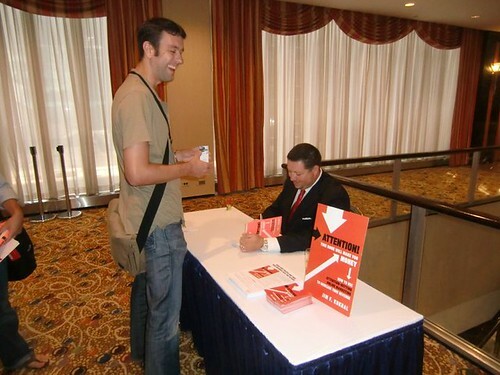 A little more than a week ago my friend @chrisbrogan recommended @jimkukral’s book in his post ATTENTION MATTERS IN 2011. It really caught my attention and I decided to buy and start reading Attention! This Book Will Make You Money: How to Use Attention-Getting Online Marketing to Increase Your Revenue (amazon affiliate link). I have to say that like @chrisbrogan expressed on his post I am a fan also of this book. I am an avid reader and although the last book I read Content Rules(affiliate link) was awesome Attention! was able to help me integrate many of the ideas from Content Rules with real exercises I can do for my company @cimapr or my clients. One of the first lines that really stood out was when he makes the equation Attention=Revenue. He also identified Revenue as leads or something as accomplishing a minor goal. In my case having a small business getting a lead or accomplishing a goal can help you get motivated into moving along on those big obstacles when you are not meeting the larger goals. It was a delight to see how he explains that Traditional Marketing is a competition for the biggest spender. A great comparison of people who are self promoters using social networks to Amway and Mary Kay representatives. Defining brand as Who you are, what you are passionate about, and what you have expertise in will help me in explaining this to many of my clients and community. Steps on creating a solid elevator pitch. Importance of being a source of information. How to create and execute Attention getting ideas. How do you get attention that helps you and how it can benefit yourself or business? Importance of creating a tight community instead of having many contacts. Great Tips on creating a Unique Value Proposition! Favorite Lines and/or quotes of Attention! I would recommend this book for those non-believers in using online and social marketing. Also if you like a challenge and think you are very creative then you need to sign up for his first chapter challenge. One of my goals in life is to fix the many issues I can identify locally. One of the main reasons I started this blog is to correct customer service issues locally (Puerto Rico). Yesterday I received a tweet by @therealgabo related to a previous conversations we had (via twitter) on the PR Tourism Company using a U.S. based company to run their social media effort. I went into review the link which led to an article posted in “El Vocero” Puerto Rico newspaper. Approximately a month ago I wrote a post How does Puerto Rico Grade in Customer Service?. I was mainly criticizing how the Tourism company was marketing a product without getting the product right. Most products or services that are very successful first got the product right. A few days ago a post was created online titled Puerto Rico paradise plagued with pollution the article was created depicting many of the set backs Puerto Rico has suffered in the last few years. I live in Puerto Rico and I love our island and although everything depicted in the article discomforts me the reality is that eturbonews used real facts. I have to give them credit because they hit the nail on the head with the following quote. Perhaps the “Just Think” marketing campaign should “think” about the serious reality of the situation in the PR and “think” about a turnaround plan prior to drawing global attention to the many issues it faces. Do you agree with the previous quote? I really see a great opportunity for the Puerto Rico Tourism Company to realize that their approach is not adequate and will get them nowhere. On that same article the PR Tourism office responded with a press communication (going the traditional way in disagreement with the message). In no way does the Tourism Company present a way of fixing the problems depicted in the eTurboNews post instead it tries to sugar coat what has happened trying to make our current governor a hero with very weak points. My recommendation for the Tourism Department is to take a different approach to recruit people like myself who are willing to fix most of these issues. In the meanwhile our government tries to turn a blind eye to all the problems and bury there head in the sand like an ostrich waiting for this problem and many others to pass without being proactive and fixing them. How do you think we can correct most of the issues depicted in Puerto Rico paradise plagued with pollution? Do you think that the approach the PR Tourism Office took is adequate? How can we get the Product Right First? Tweets from my Twitter contacts expressing their opinions.